verdankt seinen Erfolg seinem Klang. Als Pionier unter den Brass-Ensembles hat German Brass seit seiner Gründung 1974 nicht nur Musikgeschichte geschrieben, sondern führt kontinuierlich seine Erfolgsgeschichte fort. Die zehn Solobläser und Hochschulprofessoren zeichnen sich dadurch aus, dass sie kompromisslos diesen genuinen Klang ihres Ensembles erschaffen, ihn in jedem Konzert und jeder Aufnahme aufs Neue finden und erfinden. Klang wird bei German Brass zelebriert – und für das Publikum so zum Erlebnis. one of the finest brass ensembles in the world to come out of Germany. 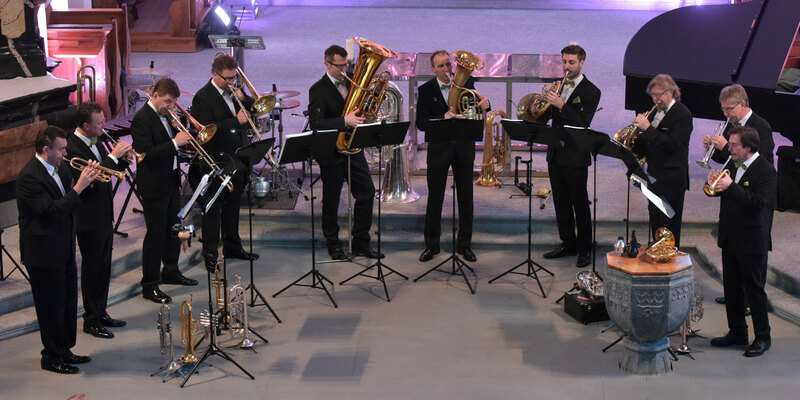 As a pioneer among brass ensembles, German Brass has not only written music history since its founding in 1974, but continues to perform its own success story. German Brass has succeeded in creating “diversity in unity”, i.e. to work the miracle of producing a unique, unmistakable collective sound with ten individualists and renowned soloists from outstanding first-class German orchestras. As an ensemble they play transparent chamber music but at the same time with symphonic magnificence and dynamics that only brass instrumentalists can produce. The repertoire of German Brass includes all stylistic directions and kinds from Scheidt to Shostakovich, from Dixieland to Bossa Nova. In their concerts the ensemble nurtures and surmounts the division in two kinds of musical styles with professionalism and fun: the programs contains arrangements of classical works as well as adaptations and compositions of musical evergreens which have mostly been arranged and composed specially for GERMAN BRASS and pay tribute to the typical sound and the technical brilliance of the ensemble.